The Lost Explorer 'Yucca' Jacket made in USA. Light pink (Hibiscus), washed style. Pointed lapels with notches. 3 button fastening, wonderful horn buttons with ring fastening so they can be removed. 3 button working cuffs also horn with ring fastening. 2 pockets with curved flaps and over right pocket a ticket pocket also with flap. There is a left chest pocket with curved flap. Central vent at rear. Beautiful finish inside and out, with French seams. Doubled layer yoke. 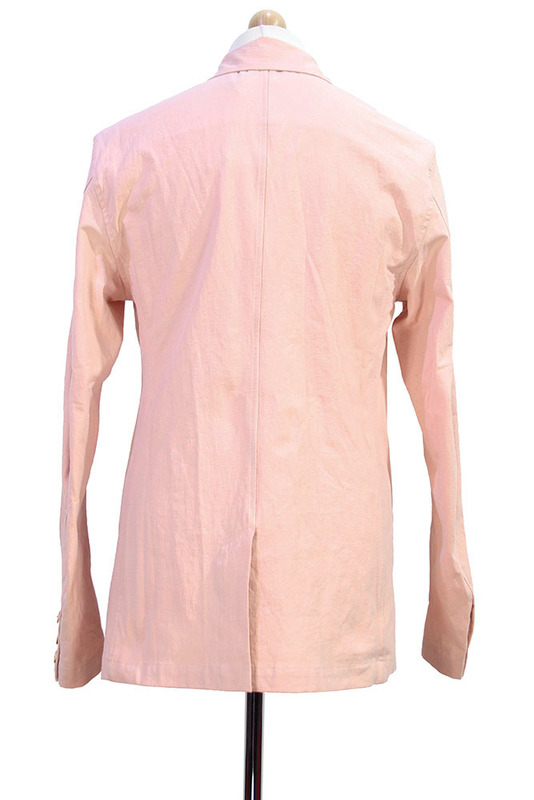 Great Summer jacket, that matches the other garments in the same colour. The trousers, or shorts making a brilliant suit.